The answer: Her little sister Kako, not yet physically described but nevertheless named by Danny. So I played with my own impressions and ideas of anime for how she might look. And these are the result!!! Damn, it’s been AGES since my last Photoshop composition of this magnitude (hence the laziness, lol). And here, I spent close to 20 hours over 2 days on my laptop — no pencil or paper or scans, just online sketches, images and screenshots in dozens of layers in Adobe Photoshop — but it was definitely worth it!!! Next step: Contact Danny, lol! P.S. Note that Mirai means “future”, and if my Japanese-English dictionary is correct, Kako means “past”. Otakurl it! | Check out Danny’s post! Kako – Her big blue bow is a larger reflection of the blue bows on her sister’s shirts, and her hair curls refers to her potential “timestep” loops in time. Her face is a slight alteration of her sister’s face, her outstretched arms comes from a Rozen Maiden image, and her bent leg comes from a Gunslinger Girl wallpaper. For her colors, her golden eyes and hair (with a similarly stubborn and standing tuft, lol) seemed to work best as a lighter foil to her sister’s stronger orange and brown color scheme. For her dress, an Alice in Wonderland blue also seemed to work better than green or red or pink when compared to her sister. Now, since Danny’s blog includes orange, blue and green, I added a flowing green ribbon for a bit of mysterious symbolism. Nature’s unifying flow of time? 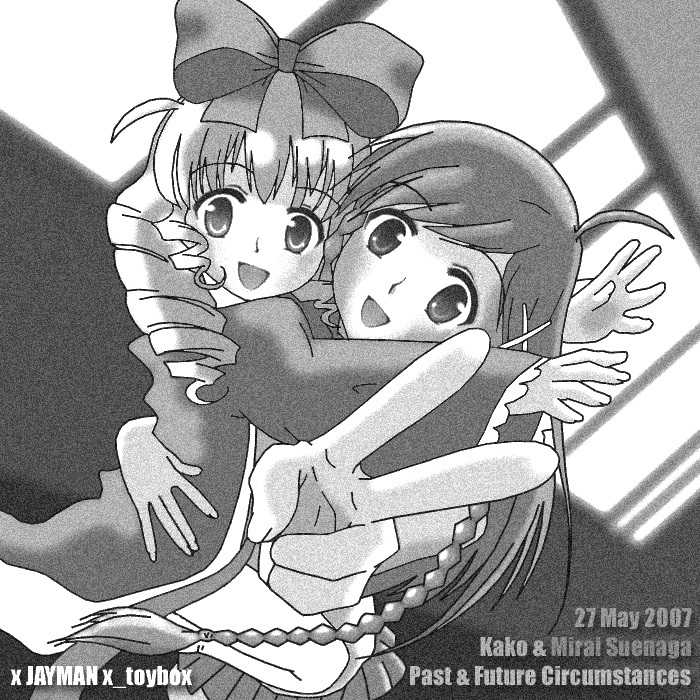 Hehehe, nonetheless, I thought Kako should create a feeling of “the past” (kako). Mirai – Based on Danny’s and Azami-sensei’s design, her folded right hand comes from a Mahoromatic wallpaper, and her V-gesturing left hand comes from an Azumanga Daioh wallpaper. Hallway – Finally, as already mentioned, the overall dance pose in the school hallway comes from the unforgettable His & Her Circumstances (Kare Kano) image. This entry was posted in Anime Art, Danny Choo, Experiments, Kare Kano, Mirai Suenaga. Bookmark the permalink. Thanks so much! Will post it soon ^o^. Azami sensei will love it too I am sure. Wow, thanx! I loved the idea from the beginning, and finally executing it, I love the results even more! Slowly but surely, your Mirai is coming to “life”, lol.